Palm Beach and West Palm Beach are separate towns, and they are very different. For a brief time, Palm Beach was the southernmost resort on Henry Flagler's Florida East Coast Railway. The railroad station was actually in West Palm Beach. A gigantic freeze later convinced him to extend the railroad to Miami and then eventually to Key West. 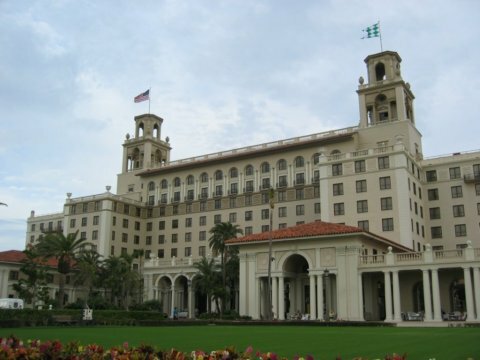 Flagler built two luxurious hotels in Palm Beach, the Breakers and the Royal Poinciana. 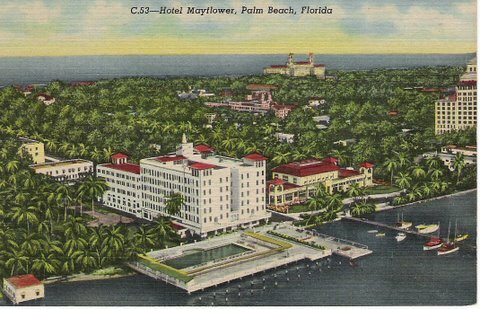 He wanted Palm Beach to be a retreat for the very wealthy, and he created a separate place for the staffs of the hotels to live. This place was West Palm Beach across Lake Worth. During the period when The Breakers was being built in the 1890's, many of the black workers - some from the Caribbean - lived in a neighborhood in Palm Beach named Styx after the mythological river to Hell. Styx had shacks that were rented to these black workers, and shortly after the big hotels were completed the workers were evicted from Styx and required to move to West Palm Beach. After they moved, the shacks were demolished. In 1902, Flagler built a mansion, Whitehall, for himself and his wife. His social life at Whitehall was instrumental in creating the "season" in Palm Beach. He entertained constantly, and his parties set the tone for the wealthy community. 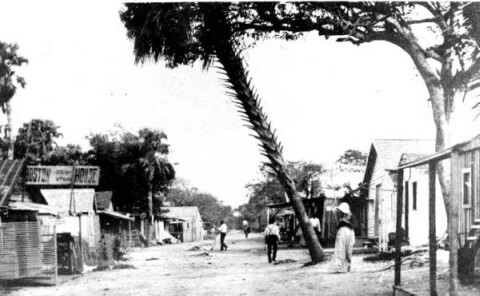 Palm Beach was incorporated as a town in 1911. It has grown over the years to a permanent population of about 10,000 with a seasonal population of about 30,000. Today Worth Avenue is a world class shopping district, and tourists enjoy wandering around the beautiful streets looking at the mansions of the rich and famous and enjoying the architecture of Addison Mizner. Palm Beach is also a great place to park your car and ride your bike. While Palm Beach is on the barrier island and confined to a relatively small area between Lake Worth and the Atlantic Ocean, West Palm Beach had tremendous amounts of land to the north, south and west and could expand as much as it needed to. Today it dwarfs Palm Beach in population and land area. West Palm Beach has grown steadily since the early days when it was a service community for the massive hotels across the lake. The northwest area of West Palm Beach was first settled in 1894 when the blacks were moved from the Styx neighborhood of Palm Beach. It was predominately a black neighborhood then and largely remains that way today. The neighborhood is on the National Register of Historic Places. The town of West Palm Beach Florida was incorporated in 1894, many years before Palm Beach incorporated. Other neighborhoods in West Palm Beach began to grow and prosper during the Florida land boom of the 1920's. Many of the houses and commercial buildings from that area still stand and make the city a tremendous collection of interesting old buildings. The City of West Palm Beach has created many Historic Neighborhood Districts that have helped preserve these old treasures. Many of the neighborhoods are also on the National Register of Historic Places. 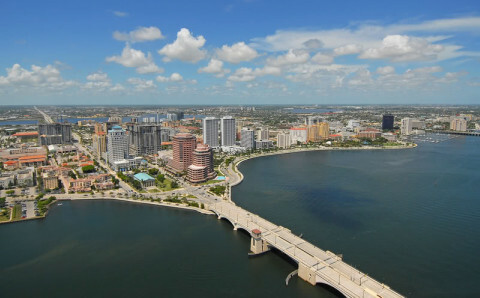 West Palm Beach had some tough years economically after the collapse of the Florida land boom and even until after World War Two. Crime was a serious problem, and business districts were not doing well. In the 1960's the City's first enclosed mall was built and things started picking up. Since then, the Clematis Street entertainment district in the heart of downtown and City Place have made West Palm Beach an exciting place to live and work. 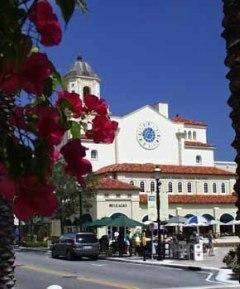 City Place opened in 2000 in downtown West Palm Beach. It looks like a European city, and has excellent shopping and dining and a movie theater. There are also condos, apartments and offices. A former Methodist church, built in 1926, is the focal point of City Place. The developers have restored it, and it now serves as a cultural center with art displays, theater and music performances, and school activities. The current population of West Palm Beach is 100,000, and it is in the heart of Palm Beach County with a population of 1,300,000. It is one of the major cities in the South Florida population center of more than 5 million people.